European Commission Chief Jean-Claude Juncker has called on EU member states to resettle about 160,000 refugees, saying Greece, Italy and Hungary can no longer handle the burden alone. Speaking to the European Parliament Wednesday, Juncker urged Europe to face the current refugee crisis with solidarity. He said the granting of emergency relocation in 22 member states must be done "in a compulsory way" to avoid delay. "We Europeans should never forget why giving refuge and complying with the fundamental right of asylum is so important," Juncker said. He is urging EU interior ministers to endorse the resettlement plan next week at a meeting of EU interior ministers. Juncker also said he believes in allowing asylum-seekers to work while waiting for their asylum applications to be processed. He said he expects all member states to pitch in to an emergency trust fund to address future such refugee crises. The Commission's plan calls for an expanded country-by-country migrant quota plan throughout much of Europe, to accept thousands of asylum-seekers from the Middle East over the next two years. Under the plan, Germany, France and Spain will take in the most, followed by Poland, the Netherlands, Romania, Belgium and Sweden. Europe is facing its biggest stream of migrants since World War Two, but the quota idea is controversial and adamantly opposed by Hungary and some other EU states. The adoption of quotas is uncertain, with European leaders already rejecting a proposal in June that covered just 40,000 refugees. The new distribution of asylum-seekers would be based on a country's economic output, population, unemployment rate and the number of refugees each nation already had agreed to accept. Chancellor Angela Merkel in Germany, where refugees have been welcomed with food, water and toys for children, has called Juncker's plan "a first important step." In remarks Wednesday, she said if Europe fails on the refugee issue, then it has lost one of the founding impulses for a united Europe: universal human rights. But, on a note aimed at conservatives, she cautioned that migrants coming to Germany out of economic need, rather than fleeing war or political persecution, must be turned away. She said it is not enough to agree to take a certain number of refugees without caring further about their circumstances. Earlier, Merkel told reporters that an EU requirement calling for asylum-seekers to first be processed in the EU port in which they arrive "no longer works," because it means that Italy and Greece are handling the bulk of the influx escaping from the Middle East and Africa. A key United Nations migration official, Peter Sutherland, said Tuesday it is "not enough" for the United States and wealthy Persian Gulf states to donate money to help refugees escaping the Syrian conflict and refugee camps in neighboring countries. Sutherland said wealthier countries need to take in the asylum-seekers as well. "Buying your way out of this is not satisfactory," he added. The U.N. said Secretary-General Ban Ki-moon called the heads of seven European governments in the last two days and stressed that the large majority of migrants are fleeing war and violence in their homelands and have a right to seek asylum. 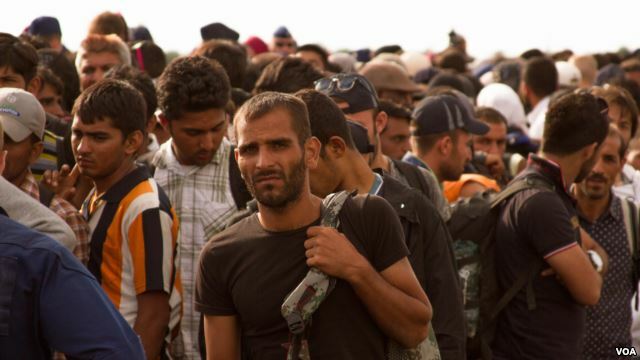 Germany said it expects 800,000 refugees this year. Vice Chancellor Sigmar Gabriel said his country could accommodate a half-million refugees annually for several years. One Syrian refugee, Mohammed Dahha, said he wants to reach Sweden and is looking for a peaceful land. "The people, they are moving from country to another country, from Asia to Europe, to get rest there, OK? To be under peace," he said. "They're looking for peace, because you cannot live without peace." As refugees from Syria and other war-torn nations make their way from Hungary to Germany and other western European destinations, thousands more are stuck in Greece and Macedonia, with no idea when they can move on. The United Nations refugee agency says about 30,000 migrants have arrived in Greece, including 15,000 to 18,000 on the island of Lesbos alone, while 7,000 Syrian refugees have arrived in the Former Yugoslav Republic of Macedonia. The migrants are waiting to be screened before they are allowed to head on to seek asylum.